A specifically formulated instant acting scalp cleanser which will leave your scalp and hair clean and refreshed. This product is designed to safely prepare the scalp for topical hair loss treatment products. 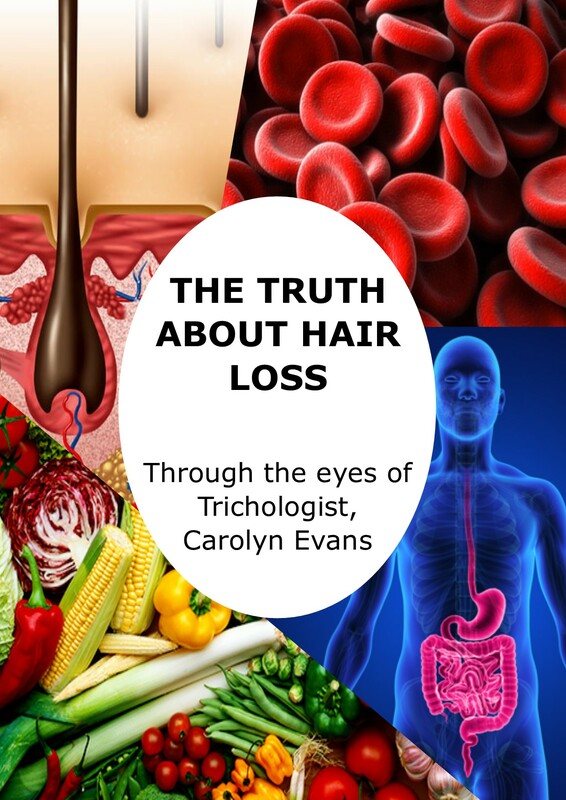 Topical treatments are more effectively absorbed to reach the target site of the hair bulb, when the scalp is clean. 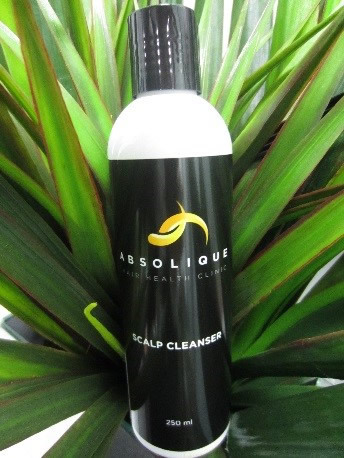 Absolique Scalp Cleanser was designed to be a Safe Scalp Cleanser. Consider this, Scalp is Skin, you shouldn’t wash your scalp skin with a Hair Shampoo! 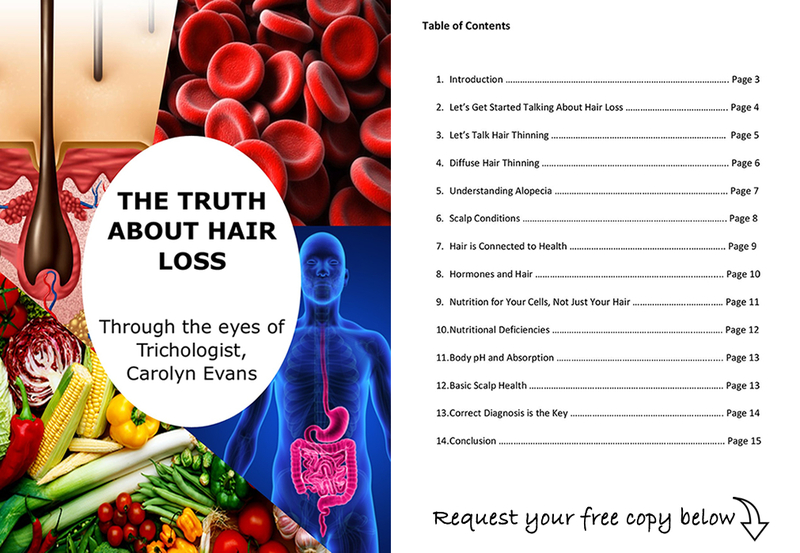 Hair is a ‘dead’ fibre, and has different structure to skin. Ingredients in Absolique Scalp Cleanser have properties that safely cleanse the scalp skin of scale and oil, and also remove product build up from the hair, but it is not a Hair Shampoo. Other ingredients in Absolique Scalp Cleanser have properties which are stimulating, antifungal, antibacterial, antistatic and antimicrobial. These unique properties work together to cleanse the scalp allowing an easier passage for topical Hair Loss Treatments through the scalp. Absolique Scalp Cleanser is a great hair and scalp cleanser, just for a clean healthy scalp, or to prepare the scalp for topical hair treatments. It is good to use if you find your hair gets weighed down easily. Perfect if you don’t like the ‘product’ feeling in your hair or if your hair shampoo is no longer working for you. Great for fine hair, as it effectively cleans the scalp oil away and leave hair clean which makes it look thicker and fuller. Short Hair: Apply Absolique Scalp Cleanser to wet hair and massage into scalp to form a cleansing lather. Rinse and repeat. Always cleanse your scalp at least twice. Follow with Absolique Scalp Tonique if you are preparing your scalp for topical treatment. Long Hair: Apply Absolique Scalp Cleanser to wet hair and massage into scalp to form a cleansing lather. Don’t pull lather through lengths of hair. Focus on the scalp. Rinse and repeat. Always cleanse your scalp at least twice. Follow with Absolique Scalp Tonique if you are preparing your scalp for topical treatment. Rinse Absolique Scalp Tonique from Scalp and hair. Apply prescriptive hair shampoo for your individual hair type to mid-lengths and ends of hair. Keep hair shampoo 10 – 15cm away from your scalp. Rinse and follow with prescriptive hair conditioner. Absolique Scalp Cleanser is FREE from ingredients that can harm your health. Ingredients: Water (Aqua), Sodium Lauroyl Methyl Isethionate, Coco Amido Propyl Betaine, Sodium Methyl Cocoyl Taurate, Mentha Piperita (Peppermint) Oil, Glycol Distearate, Phenoxyethanol, Caprylyl Glycol, Sorbic Acid, Sodium Chloride.